It was the year 1994 when Japanese company, Sony, made its entry into India. Seven years later, in 1997, the South Korean crusader duo – LG and Samsung – took the Indian market by storm. What was then expected to be a short-term ruling has turned out to be the game-changer for consumer electronics in the country. We look at how these three brands have evolved in the consumer durable and IT range in the country. According to leading research analysts, the expected market size for television and laptops was about Rs 25,000 crore and the estimated size in terms of volume for television sets was about 20 million in 2011. As per Ernst & Young, about 60 per cent Indian households own a TV, which, for a country with 1.2 billion people, is hardly enough penetration with regards to its potential. This is primarily because of the disparity in regions across India, which is highlighted by the fact that metro cities account for about 30-40 per cent of TV sales in the country. 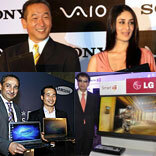 LG, Samsung and Sony together account for more than 50 per cent of the television market in India. During the last two years, 11.5 per cent of Indian homes bought a TV set. This figure is even higher among the top eight metros at 21.3 per cent, which means about one in every five home in these cities acquired a TV set in the last two years. The urban consumer durable market for products, including TV, is growing annually by 7-10 per cent, whereas the rural market is zooming ahead at around 25 per cent annually. The LCD television market in India in 2010 was estimated at 3 million sets, which doubled from 1.5 million sets in 2009. LCD TV revenues rose to Rs 12,000 crore in 2011, up by a stunning 60 per cent from Rs 7,540 crore in 2010. The three brands, Samsung, LG and Sony, continue to dominate the segment with a combined market share of 72.5 per cent. They are each in the sales vicinity of 0.7- 0.75 million sets. “We have over 30 per cent market share in FPTVS,” informs Rahul Saighal, CMO, Samsung India, which has more than 70 models of LCDs, LEDs and Plasma TVs, starting from as low as Rs 13,000 up to Rs 2.3 lakh. The LG range, on the other hand, is available from Rs 14,000 to Rs 4,00,000. For Sony India, the brand expected to sell 10 lakh units of BRAVIA by the end of FY11, which, according to sources, was achieved. So, who is the consumer base for these manufacturers? S H Park, Director, Home Entertainment, LG, says, “The Indian consumer durable industry has witnessed a considerable change in the past couple of years. For us, the target consumer is the youth who wants to associate with technology, gaming enthusiasts and consumers, who are in a constant lookout for smart entertainment.” He expects the premium products to be the future growth drivers in the consumer durable and electronics industry. Representatives from Samsung as well as Sony agree with Park and say television continues to be the mainstay of the consumer electronics industry in India, with the transition slowly occurring to newer technologies such as LCD and PDP, which have been slow till now because the consumer was confused between LCD and LED choices. The rise in demand for LCDs and LEDs in the urban and semi-urban markets has brought about high upgradation scenarios. “In the metros and larger markets, we are seeing customers adopting new technologies like Smart televisions and LED/LCD televisions. In semi urban markets, too, slimmer displays are being preferred, and this is the reason why FPTVs are gaining in popularity. A large part of the customer base in the metro markets is the upgrade market,” Saighal informs. The desire to experiment with varied technology has given the impetus to these brands to undertake innovation, which is considered as their prime forte. In terms of LCD TV sizes, 32-inch models have been the most popular, with a 41 per cent unit share. The 24-inch or smaller sets accounted for 36 per cent market share. Currently, 21-inch and smaller screen CRTs are the most common televisions in India. “It is expected that 22-inch and 24-inch LCD TVs will be an important product in the Indian market. With makers rationalising the prices of this category, the LCD contribution has increased, and we expect that LCD TVs will capture majority of the television market share. The Indian consumer electronics industry will grow at a CAGR of around 18 per cent during 2011–2014,” says Pinakiranjan Mishra, Partner and National Leader – Retail & Consumer Products, Ernst & Young India. These brands have evolved in India in such a way that they are no longer considered multi-national brands. What is the secret behind this? According to the Lead Analyst of Computing Products at Cyber Media Research, South Korean brands felt the need to introduce products that an Indian customer would relate with in terms of value for money, ease of use and advanced technology. These ingredients have ensured that upgradation occurs after regular intervals, which has provided them with success in the Indian market. Localising has been stressed upon by a lot of manufacturers, but how they implement it into their products is a more vital aspect that these brands have utilised. As per the CMR data, Samsung is currently leading the LED TV segment. Conclusion: The competition is tough between Sony and Samsung while LG has some catching up. How strong is the PC market? Now that the TV market has been assessed, we look into the laptop and PC market in India. As per research figures, the number of units sold last year was 48 lakh and the sale of laptops generated revenue of about Rs 3 million. Projected figures for PCs in India from 2012-16 is 10 per cent. The laptop and PC penetration in India is a meager 6-7 per cent, which is nowhere even close to China, where the penetration is nearly 70 per cent, only behind the USA. According to the Lead Analyst of Computing Products at Cyber Media Research, Sony is the undisputed leader in this segment. The highest selling price for laptops is Rs 30,000-35,000, which is considered affordable. The estimated number of PCs (including laptops and tablets) to be sold this year is 1.11 crore units. Conclusion: Sony is the clear leader when it comes to laptops out of these three brands.